Make your companies trade show booth the talk of the show with activities and attractions that will stop attendees in their tracks. With "Branded" traffic building products such as Danceheads, Super Booth or our state of the art Virtual Reality Simulation Games we will have people lining up to be part of the action at your booth. Trade shows come in all shapes and sizes but they all have one thing in common, they help you and your company get your name out there. You want to be the one thing attendees remember from the show. Creative Event Services helps you with some great Trade Show Event Ideas in the Boston and New York areas that will make you and your company stand out from the competition. 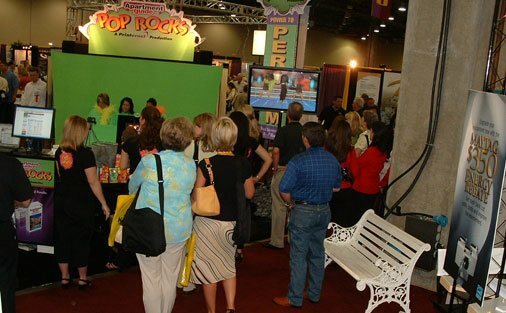 You want to draw people in with innovative trade show booth entertainment. Give us a call today to arrange for some fantastic Trade Show Event Entertainment that will ensure your company name stands out from the rest when the show is over. We specialize in Trade Show Traffic Building in Rhode Island and will work with you to draw in the clients and partners you want to work with. We realize that each trade show is different and that each one reflects the industry they are catering to. Our expert staff will work with you and your staff to determine what the best marketing strategy for your industry and that particular trade show are. We help with all aspects of the trade show set up. From the booth arrangement and decoration to the giveaways, contests and entertainment. A trade show is one of the best ways to garner attention for your business. It allows you and your company to make connections that will be profitable. Make your trade show booth the talk of the show, that will be remembered long after the doors have closed with activities and attractions that stops them in their tracks. Using our traffic building products such as Danceheads, or our state of the art Virtual Reality Simulation Games you will have people lining up. To arrange a conference with one of our specialists call us today at 1-888-794-9494. We cover the New England area and beyond.